Trigger the Summon of each friendly creature. 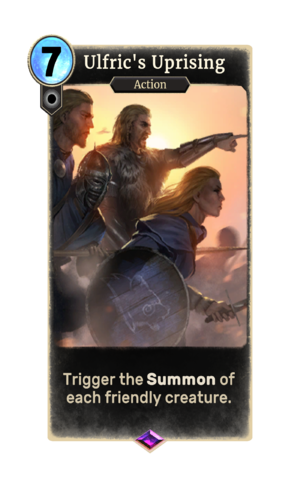 Ulfric's Uprising is an epic Neutral action card. It is part of the Forgotten Hero Collection. It is available as part of the Forgotten Hero Collection. The card's name refers to the Stormcloak Uprising, which was spearheaded by Ulfric Stormcloak. Both of these appeared in Skyrim. The card's magicka cost was increased from 6 to 7 in patch 1.72.4. This page was last modified on 24 September 2018, at 23:29.